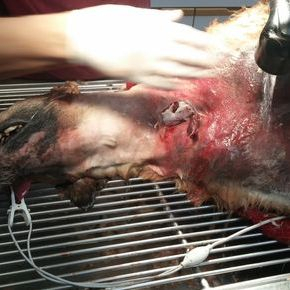 When Kaos came to us she was bleeding from this wound on her neck and her heart rate was high indicating her body was struggling to compensate for the trauma and blood loss. 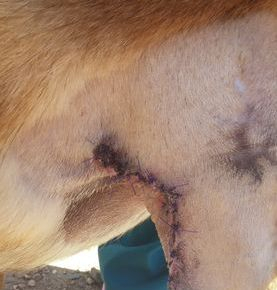 She was anesthetized and clipped for surgery - water was used to remove large pieces of debris prior to surgical preparation. The reddish-purple areas are bruises. 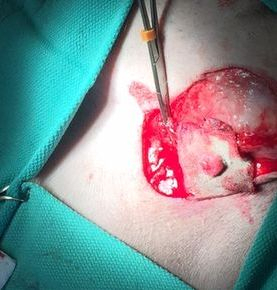 We explored the wound to find the source of the bleeding, fortunately most of the major vessels (like the carotid artery and jugular vein) were intact. 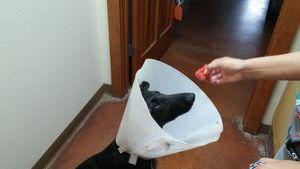 The wound extended right to her trachea, but fortunately did not compromise it. We were shocked at the size of the deep penetration which was filled with egg sized blood clots. 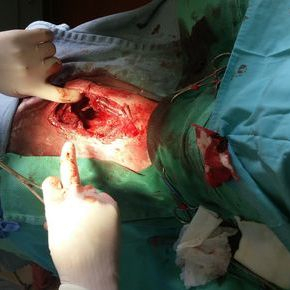 Several neck muscles were severed, we removed the sections that had lost blood supply and tried to put them back together as anatomically as we could. It was a team effort and miraculously Kaos made a rapid and complete recovery! Given the extent of the damage and the debris in the wound we were amazed how quickly it healed. Featured Case: It's Just Vomiting, Right? 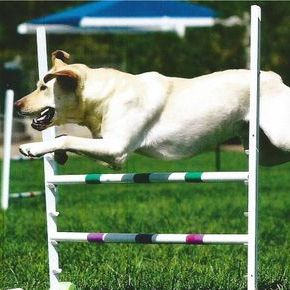 Easton, a 5 year old Labrador retriever enjoys giving kisses and competing in agility. One day his very astute mother noticed some nausea and gagging. The final straw was when Easton started vomiting his breakfast. 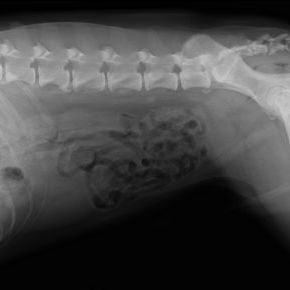 With any vomiting dog one of the most important things we can do is rule out an obstruction in the intestines, x-rays are the first line of screening to make this determination. 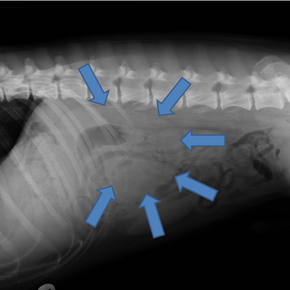 However, on Easton's x-rays we saw something a little unexpected. 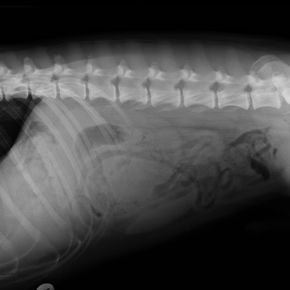 This x-ray is like looking at Easton laying on his back. 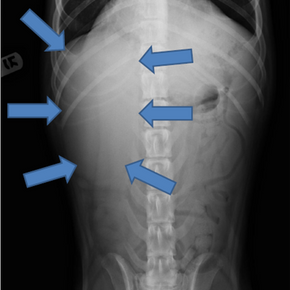 If you note on the left side of this x-ray there is a radio-opacity (i.e. large white thing) that shouldn't be there. Whoa! Look at that Kidney! The right kidney was pushing on the outflow tract (exit) of the stomach, causing Easton to gag, spit up bile, and vomit depending on how hard the kidney was pushing on the stomach. Easton's condition is known as hydronephrosis - or a build up of fluid in the kidney. It was determined after testing that Easton had hydronephrosis caused by a congenital abnormality (he was born with a broken kidney). The build up of fluid in the kidney stretched and deformed the tissues responsible normal function of this kidney. The enlarged kidney also pushed against the surrounding organs including the stomach. 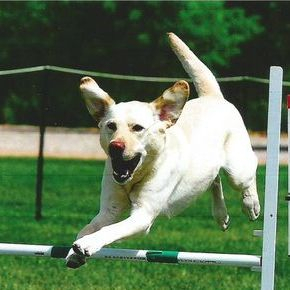 Now Easton is on special food to help his lone left kidney keep performing as well as Easton does at agility! Once Easton's kidney was surgically removed by a specialty surgeon he felt much better! 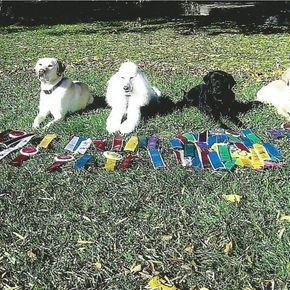 The group looking good with their haul of ribbons for 2015. 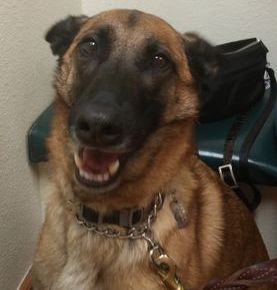 Loti, a beautiful Belgian Malinois, very suddenly developed a blister like lump (bulla) on her right front leg. We tested it and found evidence of a reaction like an allergy, she received treatment and the bulla resolved. However, once the medications were stopped the bulla re-appeared! We re-tested it and found mast cells (hers looked just like the picture below from the University of Montreal). 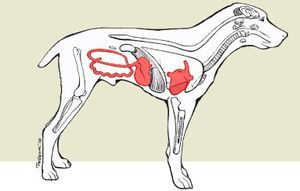 Mast cell tumors are REALLY common and account for between 10-20% of all tumors dogs get. 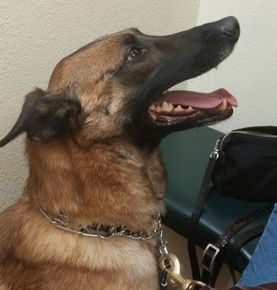 Fortunately, Loti's tumor was a low grade and completely removed - the best prognosis! This is an image of mast cell tumors (borrowed from the University of Montreal). The red blood cells are smaller and maroon in color. The mast cells are the larger cells with little purple granules, the larger purple circle is the nucleus of the cell where all the genetic material is saved. Mast cell tumors can often act like allergies because of these purple granules. Each granule contains agents like histamine which can cause irritation along with dramatic and dangerous drops in blood pressure. WIDE margins were taken around this mass to insure the best possible prognosis. The original mass was only about 1.5cm in diameter and look at the size of the scar! This is why early detection is important. 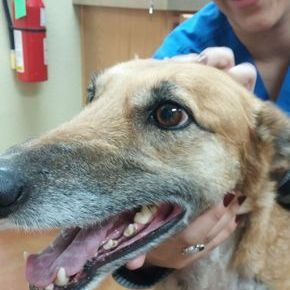 All surgical procedures are done in a sterile manner with the pets under anesthesia. Because of the risks associated with degranulation (release of all those purple granules), special medications, intravenous catheters, and monitoring are used to make the procedure as safe as possible. 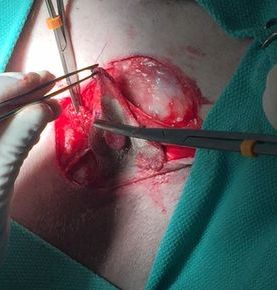 Once removed the tumor and associated skin are labeled for orientation and sent to the laboratory to confirm the diagnosis and grade the tumor. See the black scar just in front of the incision? 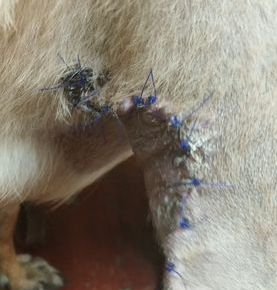 This scar was from a precious cut - dogs frequently will produce pigment in areas where there was trauma (or skin irritation from allergies, chronic licking). 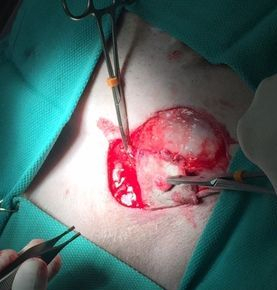 Also note the difference in skin tones from the front (cranial) of the incision to the back (caudal) of the incision - because of the amount of skin removed, the softer skin from the armpit (axilla) was pulled around to the haired skin of the shoulder. So happy to get her elizabethan collars off! 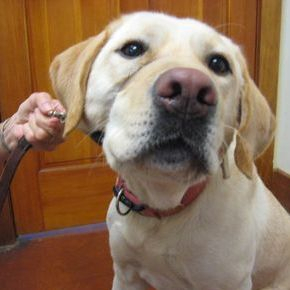 Parvo is a highly infectious virus that affects unvaccinated dogs of all ages. It is transmited through feces and can live in the environment for very long periods of time. Primary symptoms include vomiting, diarrhea, lethargy, and if left untreated - death. You can prevent this tragic illness from affecting your dogs by following a simple vaccine protocol. We reccomend starting when your puppy is between six and eight weeks old, boosting every three to four weeks until at least sixteen weeks old, and annual vaccines throughout the lifetime of your dog. Heartworm is a parasite that is transmited by mosquitos, lives in the heart and arteries of the lungs, and is fatal if left untreated. Because of New Mexicos dry environment you might think that your risks are reduced, but due to our proximity to the Rio Grande and irrigation ditches, our clinic continues to see and treat heartworm positive dogs every month.Yearly testing is the first neccesary step in preventing heartworm from affecting your canine companions. Once we know the heartworm status of your dog we can help you decide which of the many preventative options is best for you and if treatment is required we can help. Feline Leukemia Virus (FELV) is a retrovirus that is spread from one cat to another through bite wounds, contact with infected urine or feces, and from a mother cat to her kittens either in the womb or during nursing. It causes several maladys in cats including cancer, blood disorders, and immune deficiency similar to human HIV virus. 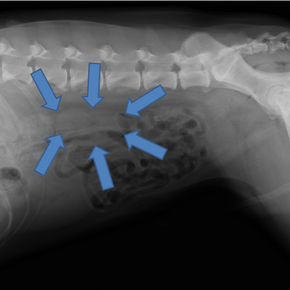 Infected cats will often show symptoms similar to Feline Rhinotracheitis infection. FELV is one of the more common diseases we see in cats at our clinic and is easily preventable with a simple vaccination. 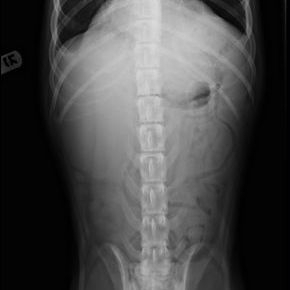 Feline Rhinotracheitis is another very common viral disease we see at our clinic. It is transmitted from cat to cat through contact with eye or nasal discharge, saliva, or contact with infected objects such as food or water bowls. Symptoms include coughing, sneezing, lethargy, eye and nasal discharge, conjunctivitis (inflammation of the inner eyelid), fever of up to 106'F, eye ulcers, and loss of appetitte. This disease, as well as several others, can be prevented with regular vaccinations and wellness exams. 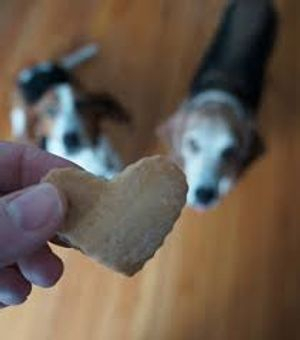 Show Your Pet Some Love With Healthy and Safe Snacks! Like buying candy for kids, we often think snacks that have been specially packaged for pets are the best treats in the world. Why would they want anything other than a tasty treat? But, a lot of those packaged pet snacks and treats are the equivalent of candy. They are not a big deal, as long as you don’t do too much of it, since they are mostly devoid of nutritional value. Please find below a brief list of healthy treats that have been found to go over well with a lot of pets, followed by a list of foods you will need to avoid. What is the best way to feed these types of treats? The foods should be baked or steamed, cut up into smallish pieces, and only given in small amounts at a time.This will prevent both choking and an overload of carbohydrate- and calorie-rich foods.You can give the vegetables and fruits by themselves, or you might mash or puree them and mix them up with the prepared food and given at meal times. Replacing your pet’s dense, high fat packaged treats with healthy treats like fruits and vegetables will be one of the most beneficial things you do for your pet. Over the long term, your pet’s health and immune system will be stronger, aging will not be as severe, its weight will stay steadier, and if weight is already an issue, you may even see your pet’s weight become more manageable -- if you stick to it and include moderate exercise. With any change in diet, it is important to observe your pet for issues that can arise in response to the change. If your pet begins to show digestive or behavioral changes, stop feeding the new foodstuff and consult with a veterinarian if the problem does not go away in the absence of the added food. Luna tries to wait patiently for her watermelon.